Clean all mushroom in running water and pat dry. Cut them into pieces. Mix all the ingredients given in “to marinate” and set aside for 20 min. Meanwhile, heat a pan with oil and add cinnamon cloves cardamom powder. When nice aroma comes out, cashew nuts and curry leaf. 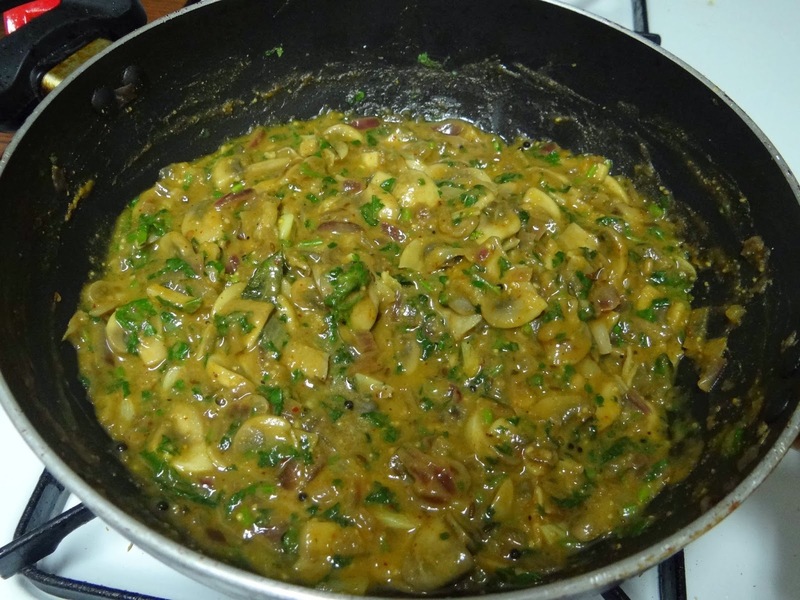 As it turns brown , add onion and saute till onion becomes soft. To this combine ginger garlic paste and saute till the raw smell leaves. Add coriander powder, cumin powder, tomato, salt and saute. Then cool this mixture and grind into a smooth paste. Heat the pan with oil, add the marinated mushrooms and cook for 3-4 min stirring occasionally. Add the masala paste and add little water if desired and close the lid until gravy gets thickened.